Love That Max : Photo break: Feeling chilly? I should have titled this "I am procrastinating getting my work done" but figured "Photo break" was maybe a little more enticing. I love photography, if you couldn't already tell by all the pictures I take of the kids. In the name of giving props to amazing images, in the name of making our days a little more enjoyable, and in the name of procrastination, I'm going to start putting up cool photos on occasion. Don't you just love the expression on the molting penguin's face?! 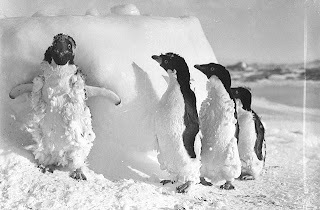 Photo by Frank Hurley, taken during the first Australian Antartic expedition, 1911-1914. From the collections of the Mitchell Library, State Library of New South Wales. See, you have a good eye when you take 'em AND when you pick 'em! So cute Ellen! That's about what it looked like in KC a few weeks ago! I learned on Million Baby Crawl that only 200 out of over 800,000 products are ever safety tested. The Runaway Moms Club: Are you in? Got any good tricks for family dinner? Is your child skinny? Plump? Just right?